We have had many requests for the videos we have running on our stand at shows, so we have compressed some of them and made them available for you to download. We hope you have as much fun watching them as we had making them. As we develop more we will make them available here so keep checking back. 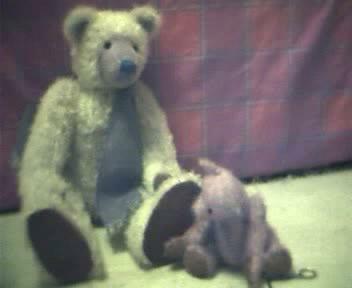 The videos have been created using a standard webcam to achieve the 'fuzzy' look by Scott Border and Chris Lancaster. If you have any ideas for possible future scenes and activities, please let us know. Please note that no bears were hurt during the making of these videos. To view the videos, click on either the sample frame from the video or the link below it. If you experience problems viewing the videos, it may help if you 'right click' the link and choose 'Save Target As...' to save the video to your computer before running it. 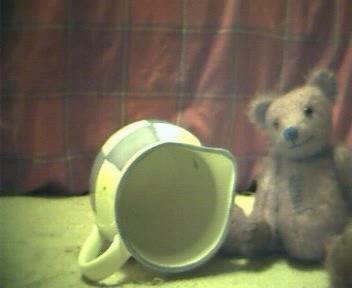 This was our first teddy video. 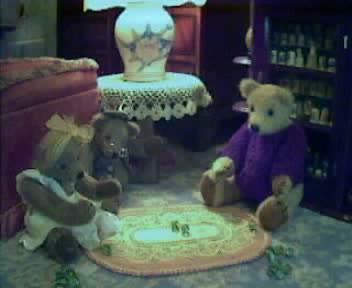 Two teddies play marbles while Grandpa watches. The girl is quite good at the game but the little boy teddy is hopeless! All the bears involved in this video have been adopted already. This video features Scruff who almost gets stuck in a jug. He did get out eventually and was none the worse for his experience. Scruff has gone to live with Scott and his girlfriend Helen where he is well loved and looked after. Scruff is caught playing with scissors - this is not a good idea! A quick word from an experienced bear puts him right and no harm is done. 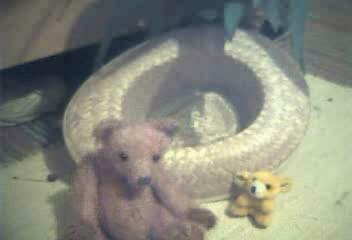 Scruff now lives with Scott and Helen but Albert, the large bear still lives at Bruin House in Janet's bedroom. Scruff is playing again! This time he meets a new friend who likes to tease him with coffee beans. Both Scruff and his new friend live with Scott and Helen.